Having a manure spreader in your line up is an excellent way to improve your soil, which can result in higher yield. We provide the Tube-Line Nitro Manure Spreader, available in 12 to 17 ton carrying capacity, that features a vertical quick drop beater system, hydraulic-driven apron chain, slip slide poly boards to resist corrosion and guillotine end gate. The position of the guillotine end gate offers control over the amount of material being pushed to the beaters by the apron chain, allowing for consistent metering regardless of manure consistency. In the instance that a foreign object jams the beaters, the apron chain fully reversible to allow the load to be moved away for easy access. 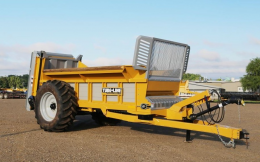 The quick drop beaters can be easily removed, allowing the pull behind spreader to be adapted into a fully functional self unloading trailer with a hydraulic end gate that can be used all year round – making it a versatile investment for your farm. Manure spreaders of just a small portion of what we sell at Flaman. We’ve got a full range of farm implements, from chemical handlers to discs, to add to enhance your operation. To learn more, visit one of our 9 locations across Western Canada to speak with one of our 30 expert sales team members and take advantage of their over 100 years combined experience. We’re happy to help you find equipment that fits your needs.